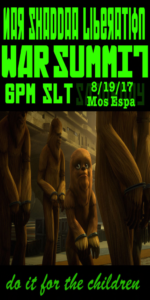 Various leaders of both Jedi and Hutt clans showed up at the war summit to show their unity in the upcoming battle to liberate Nar Shaddaa from the tyrannical grip of the dreaded Darth Malen and his deadly droid army that has had Nar under iron fisted occupation for the past several cycles. 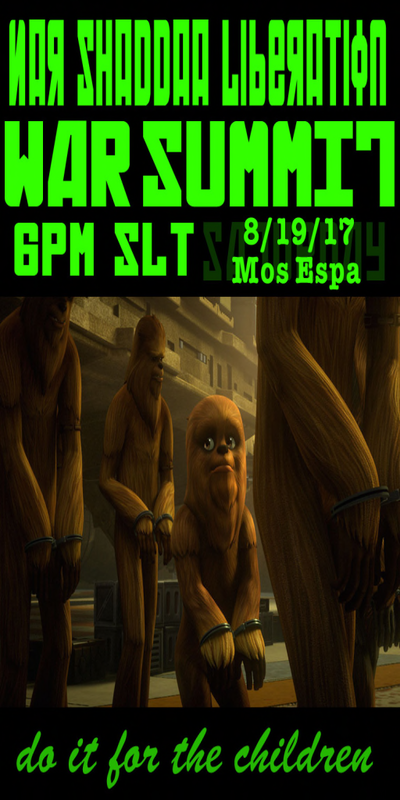 The Liberate Nar Shaddaa war summit also marked the return of Rolga Bareesh who has been acting behind the scenes, as well as the controversial Hati the Hutt. Pledging support for the liberation and in were Jedi Master Golds’hark and Galise from the Dantooine Jedi Enclave, as well as Master Tanira and Thalia from the Kalway Order of Jedi located on Yavin. 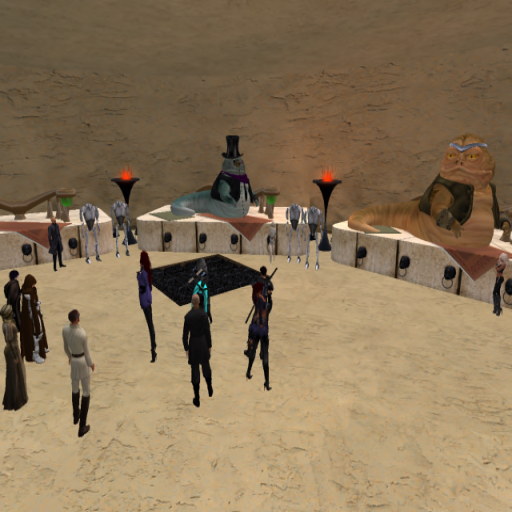 Yunapu Hutt Night took place on Corellia last night. 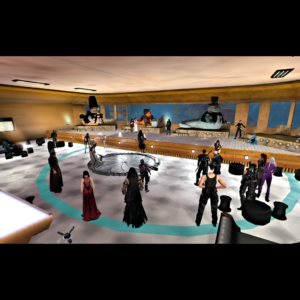 The event was a interesting evening. The Hutts sat on their throne with a fish of Progenitor in the back drop. The place was jam with people waiting to speak to the Hutts and other just being spectators. 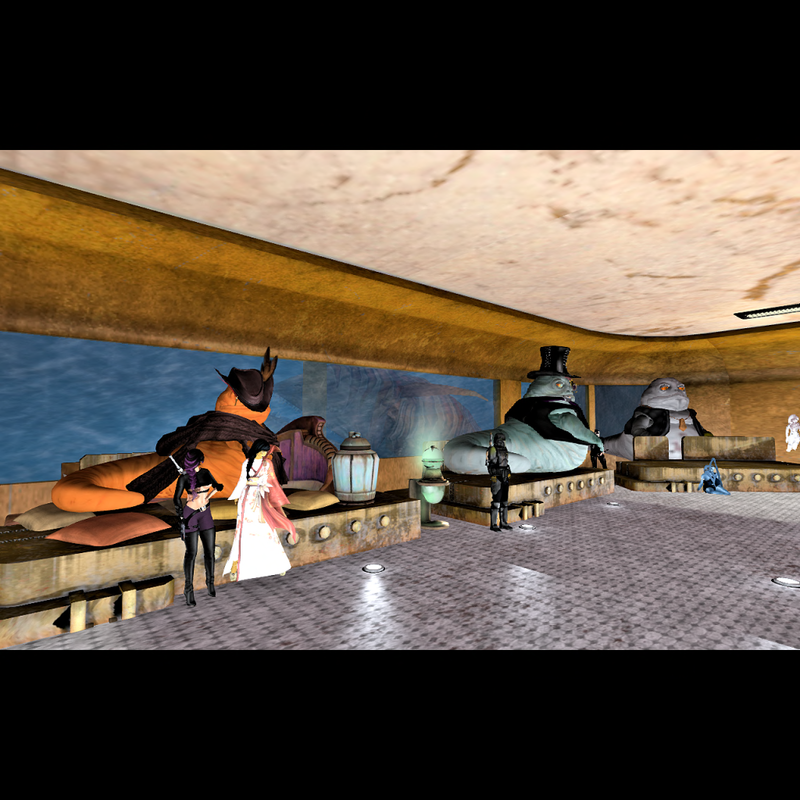 The event start off by a welcome by one of the Hutts who welcome everyone to Corellia and also said that there was a big announcement tonight but said, they would started off by allow those who wish to conducted business to speak with the council of Hutts first. 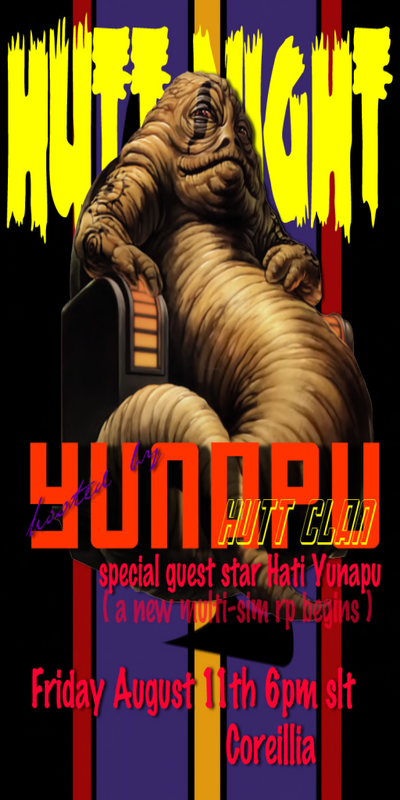 But before the guest of Hutt could speak Shaka the Hutt raised his hand and said he had announcement of his own. The host of the evening allow Shaka the Hutt speak. Shaka The Hutt Across the bridge in the plaza of the Hutts then he said, “My bank is soon to open. I assure you that I will guard your money as if it were my own, and will conduct standard business practices so that you need not fear any difficulties. Loans, savings accounts, checking, we are capable of all your banking needs.” He then wave to his servant and then led up his cigar and lean back..
Xypher was first to speak to the Hutts who offer himself as an employee to be hired of. 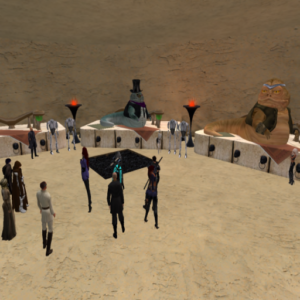 The event was follow by other that night that wanted to offer business like Darth Nessa Who thank Shaka and honor him with two Rancor and was delighted to continue good business with the Hutts. Shaka respond by saying. “I have a proposition for you. As you said, the zoo was not possible but I have been considering a museum exhibition of historical nature. Your own world being one of greatness in centuries past, if you should have anything suitable to add perhaps we may discuss it on another occasion?” Which she agreed to. Hutt night end with no mentioning of the big announcement spoken earier in the meeting. GNW will keep you inform if we hear anything more about this.